It's no secret that European countries have more generous paid leave policies for working parents than the United States. But just how much more is eye-opening, as a new report from Glassdoor and Llewellyn Consulting shows. While the U.S. mandates no paid leave whatsoever, the European Union mandates paid maternity leave, and separately requires more time be given to all parents so they can spend time with their children as they grow up. Many E.U. 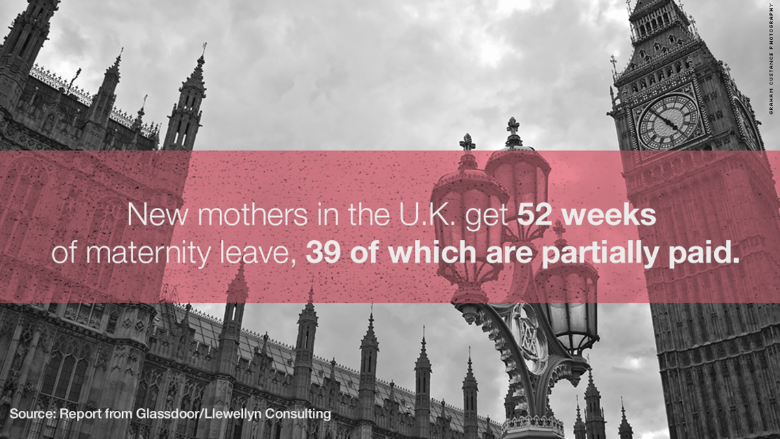 countries also offer paid paternity leave, but there is no requirement to do so. Employers in E.U. countries must offer a minimum paid maternity leave of 14 weeks uninterrupted. But several E.U. countries are far more generous, the report notes. For example, the United Kingdom offers 52 weeks, 39 of which are partially paid; Ireland offers 42 weeks, of which 26 are paid at a flat rate of 230 euros per week; and Italy offers 22 weeks, all of which are paid at 80% of earnings. Neither the E.U. nor the United States mandate paternity leave, paid or unpaid. But many E.U. countries offer it, although the terms are all over the place. Finland is the most generous by far, offering new fathers 45 days off, with pay dependent on the man's salary and varying over the period of the leave. Spain offers 15 days, France 11 days, and five other countries, including Sweden and the U.K., offer 10 days. Sweden pays new fathers 80% of their earnings during their leave. The U.K. pays 90% of earnings, up to 140 pounds a week. What really sets E.U. countries apart from the United States is the extra cushion of time offered to mothers and fathers as their child grows. Employers must offer at least 4 months (16 weeks) of parental leave during the first 8 years of a child's life. The E.U. doesn't mandate that the leave be paid, although many countries offer at least partial pay. And countries decide whether to grant the time and the money to individual parents or to their family as a unit. The best part is that the leave supports quality of life, to be used for things like spending more time with the kids, looking at new schools for them, making new childcare arrangements or taking them to be with grandparents. Time-wise, France and Germany are the most generous, offering three years. Most of it isn't paid, however. In France, one can get roughly 600 euros a month for six months. In Germany, a family is paid 67% of earnings for 12 months. Austria allows up to 104 weeks off and has five compensation options to choose from. Sweden lets each parent take 8.5 weeks and then split an additional 52 weeks between them. They're paid about 78% of their earnings for the first 56 weeks. Two countries -- the U.K. and Ireland -- offer 18 weeks to each parent, but it's entirely unpaid. How do U.S. employers stack up? In the United States, how much paid leave that working parents get, if any, is left entirely up to employers. The Family and Medical Leave Act, however, does require employers let a worker take up to 12 weeks unpaid in a 12-month period to care for a newborn, ailing family members or themselves, if they're having serious health problems. Last year, several big-name companies -- and even the U.S. military -- made headlines, announcing new or expanded policies for various forms of paid parental leave during a child's first year. But nationwide, most employers still don't offer paid leave of any kind to working parents. There have been some legislative efforts at the federal and state level to create paid family leave programs funded through payroll taxes. But to date, only three states -- New Jersey, Rhode Island and California -- have such social insurance programs in place.